Here is a new python script for maya : Text Filter. This tool allows the user to select, hide, delete etc. Objects according to a "Text Filter" ( acting like SideFX Houdini's filter ). Copy the .py and .ui file in your "userFolder/documents/maya/mayaVersion/scripts"
Then execute it, you can also drag and drop these lines to a shelves and use the .png icon. 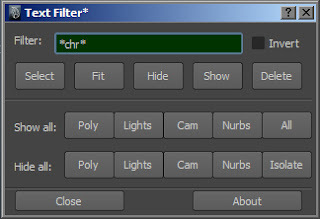 Show and Hide button to hide and show objects by categories, allows also the user to isolate the selected object. About button to have information about the tool and check update online.